It’s impossible to review this film without mentioning Poirot’s moustache. 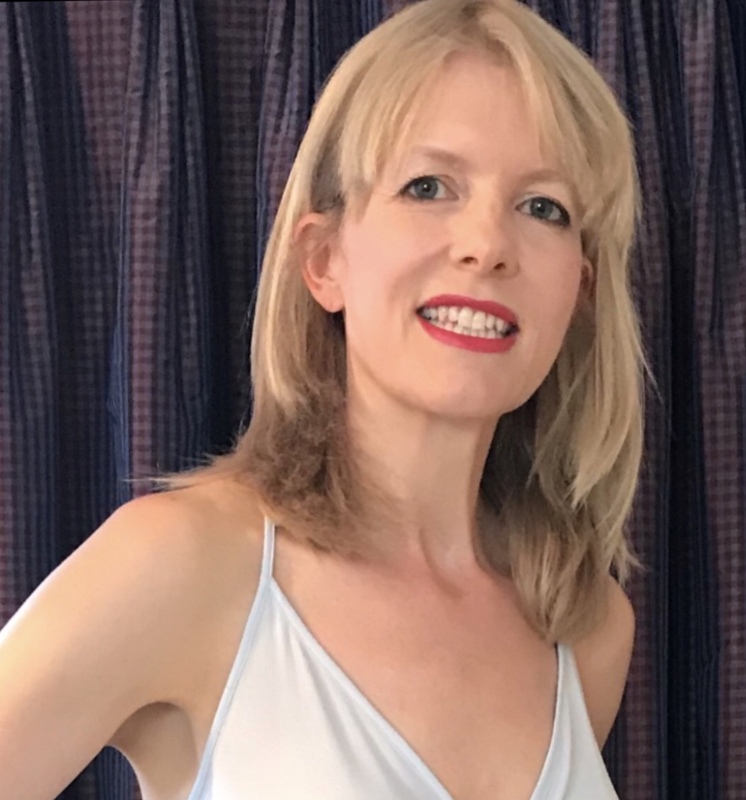 To be honest it most resembles the intimate topiary of a woman who has tried to do her own Hollywood wax and given up part way through because of the pain. But it is impressive nonetheless, and in 2017, Year Of The Movie Moustache, Branagh’s is head and shoulders – or at least shoulders and chin – above the rest. In a threeway battle between Poirot, Mindhorn, and The Dream from The Bad Batch, the Belgian would certainly win. 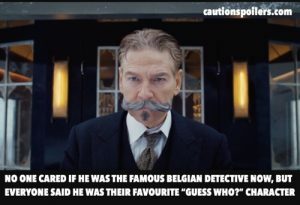 But how much does Branagh inhabit Hercule Poirot? “If it were easy I would not be famous” says the detective about crime solving, and we could say the same about Branagh’s role. His entertaining interpretation of a character portrayed so vividly before is solidly precise, as befits his size, without being irritatingly pernickety. From the first scene he sets out Poirot’s love of, not so much perfection, as balance; from his two identically-sized breakfast eggs, to stepping in animal dung and then insisting on stepping in it again with the other foot. He is a man who believes in good and evil, right and wrong. But this case and its denouement turn all that on its head. “There was right, there was wrong, and then there was you” he announces to a suspect with something akin to bafflement near the end. 30 years ago I took the overnight train from Leningrad, as it still was, to Moscow. Our carriages weren’t luxurious but there’s something about strangers travelling by rail together, surrounded by snowy darkness, that creates instant bonds. The Orient Express’s on-board hospitality overseer Bouc comes closest to understanding this: “boredom plus anonymity plus constant gentle rocking”. But somehow the characters in this movie don’t gel (and I’ll say this whether you know the twist or not). “This crime is the murdering of a murderer. Who benefits?” says Poirot, but there are so many suspects I was surprised not to be interrogated myself regarding my whereabouts in 1934. The Orient Express is en route from Istanbul to Calais, laden with its (mostly) wealthy passengers. Local children rush out to wave, while on board all is quiet opulence, with polished wood everywhere and a team of staff creating delicious meals while champagne is offered on the house. But speeding along a high mountain pass, snow swirling and lightning flashing, the train is derailed by an avalanche, coming to a stop on a perilously high scaffold. The accident leaves everyone unscathed, but in one first class cabin a body lies. It’s a murder linked to another murder, a few years before. With the passengers and crew trapped in the snow until their rescuers arrive to dig them out, Poirot has ample time for those little grey cells to do their magic, and find the killer – before anyone else is killed. There are so many (too many) characters, and if I list them all I’ll go over my wordcount. They include Ratchett (Johnny Depp), a rich sleazebag, dabbling in businesses he knows nothing about. Even his secretary McQueen (Josh Gad) later describes him as “crude, demanding, insulting and most likely a felon”. He has enemies, and keeps finding threatening messages, made the old-fashioned way with letters cut out of newspaper headlines to form the words (yet another reason to continue to champion print journalism). Mrs Hubbard (Michelle Pfeiffer) is a glamorous much-married older woman, forthright and not be silenced. I liked her (though now I’m 46 I says this about every interesting older woman on screen who possesses an impressively unfrumpy wardrobe) and Pfeiffer plays her with gusto. She also has some of the best lines. Mary Debenham (Daisy Ridley) is a governess; Dr Arbuthnot (Leslie Odom Jnr) is returning home to England to operate on a sick patient, and it’s clear he and Mary are already acquainted despite Mary’s denials to Poirot. Arbuthnot is black (he was able to train as a doctor because his medical school allowed one black medical student each year) and is subject to both blatant and unconscious racism on board. Aristocrat Princess Dragomiroff (Judi Dench) is well-wrapped in layers of lace and velvet topped off with a fluffy dog, accompanied by her companion Hildegarde (Olivia Colman). And the racist and xenophobic Professor Hardman (Willem Dafoe) is en route to a conference in Austria. But my favourite was undoubtedly Bouc (Tom Bateman). Happily amoral, crucially he isn’t hiding anything. Cheerfully admitting to getting his on-board role thanks to good old-fashioned nepotism, he’s blatant in his bad habits. Offering champagne to the intensely religious missionary Pilar (Penelope Cruz), who refuses with a comment about vice and the devil, Bouc helpfully suggests “then we should no longer speak”. Few of the characters are particularly likeable. When the train derails, injuring none of them, despite being in absolute luxury amid stunning scenery, they do nothing but moan about missed connections and engagements. There are some memorable scenes: the from-a-distance view of the train fighting its way uphill along narrow tracks through storms and lightning, counterbalanced by the calm, warm luxury within; and a scene shot from above men’s heads in the corridor, highlighting the claustrophobic, cramped nature of a train, even a luxurious one. The derailment itself means the action can move outside the confines of the Orient Express, as Poirot interviews them in the snow. The costumes steer clear of endless satin negligee evening dresses. Mrs Hubbard’s tweed and fur trouser suit, complete with multi-eye flat boots, is stunning. Less covetable, though probably just as period-perfect, are the numerous calf length skirts the frumpy characters have to wear. The plot is batshit, but as we’ve come to expect with Christie, it all makes sense in the end. 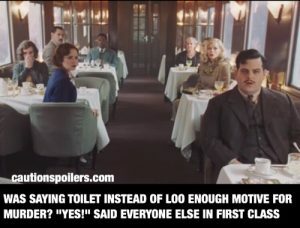 The final showdown is rather strange though, with all the remaining passengers sitting along a narrow table outside in the cold, as Poirot strides towards them, cloak flying behind him, as if he’s about to audition for Northern X Factor. It’s a witty script and though it’s not played for comedy, the last scene will make anyone vaguely familiar with Agatha Christie’s other famous books chuckle. But despite the stellar cast (there aren’t any bad performances), period details and beautiful locations, everything seems separate, and the story creeps along too slowly. And though I had actually forgotten whodunnit, I wasn’t invested enough in finding out, this time round.